ABC/Eric McCandlessThe finale of American Idol gets underway Sunday night and the winner will be crowned on Monday. But as always, the two nights will feature performances by big-name music stars. First of all, all three judges — Lionel Richie, Katy Perry and Luke Bryan — will be performing, and Lionel and Luke have both teased one or more “special guests.” Also on the bill: Nick Jonas and Mustard, performing there new single “Anywhere;” Bebe Rexha, Patti LaBelle, country star and Hootie & the Blowfish frontman Darius Rucker, Yolanda Adams, singer and guitarist Gary Clark Jr., and Kermit the Frog. If Kermit seems like an unlikely guest, keep in mind that when finalist Maddie Poppe first auditioned, she sang “The Rainbow Connection,” which Kermit sings in 1979’s The Muppet Movie. That means a duet between the two seems pretty likely. 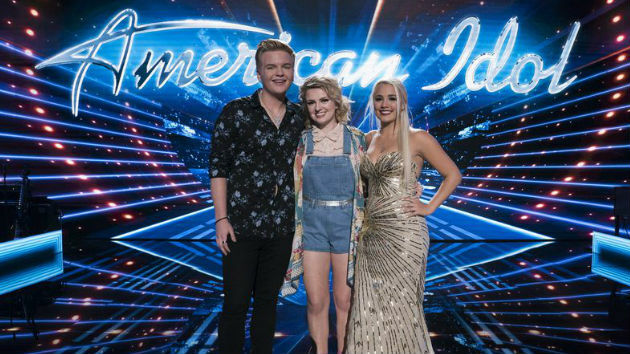 In addition to the remaining three contestants — Maddie, Gabby Barrett and Caleb Lee Hutchinson — the entire top 10 will also be performing, so you’ll get to see contestants like Ada Vox, Catie Turner, Jurnee, Michael J. Woodard, Dennis Lorenzo and Cade Foehner again. Catie tweeted that she’ll be performing an original song on the finale. In addition, you’ll see footage from Caleb, Gabby and Maddie’s hometown visits. The American Idol finale starts Sunday night at 8 p.m. ET on ABC.